Tsubaki Sprockets are the perfect complement to Tsubaki Chains. Ensure your application is running at its best with Tsubaki premium sprockets. All Tsubaki stock sprockets come with Hardened Teeth to RC35-50 standards, providing the most out of your sprockets while extending the life of your chain. Choosing the right sprocket for your chain is critical to the life of your applications. All Tsubaki sprockets are made from 1045 cold rolled carbon steel giving you the strength and workability that powdered metal cannot. Powdered metal sprockets cannot be hardened and therefore, wear prematurely. 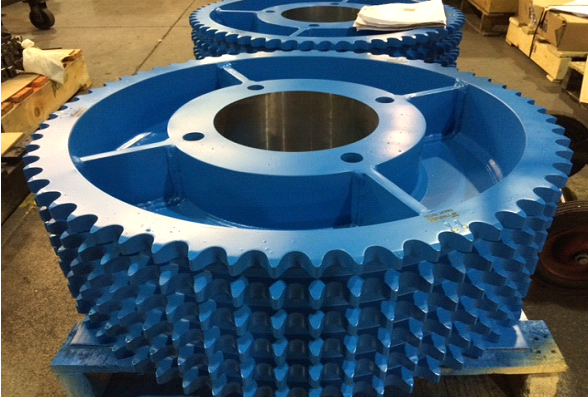 Powdered metal sprockets short life span results in frequent replacement and downtime. 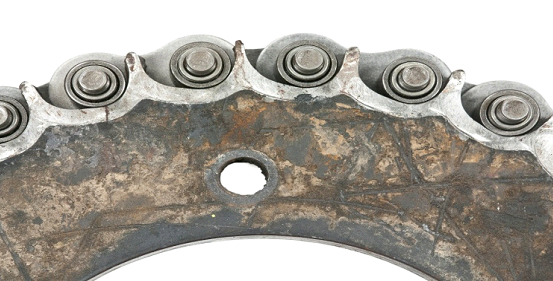 Powdered metal sprockets cannot be welded and will result in cracking when attempted. Most customers are not aware that there is a choice between soft and hardened tooth sprockets. This results in inferior products being purchased with an increased rate of replacement. Unlike many competitors’ sprockets, all Tsubaki stock sprockets come hardened as a standard, ensuring you the highest quality sprockets are interacting with the highest quality chain, keeping your application running stronger longer. An emerging global supplier for lime and limestone products has had maintenance issues with sprockets on their stone elevator, 200 feet above ground. 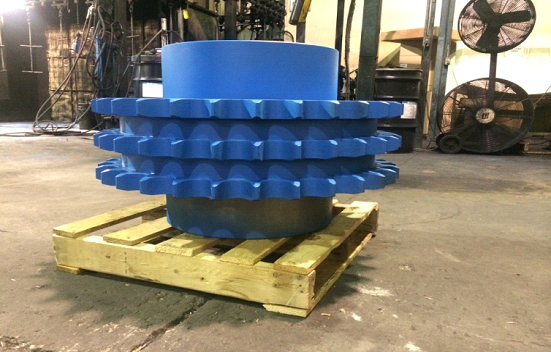 The customer was previously using a competitor’s cast, chilled rim 132C10 segmented sprocket. Maintenance was always an issue due to the location of the sprocket. Furthermore, when they had to inspect and replace the segmented sprocket, bolts had to be loosened to dismantle. This led to uneven tightening of the sprocket bolts and uneven wear patterns on the cast sprocket teeth. The customer decided to switch to Tsubaki’s steel boot sprocket with wear indicator for their application. Wear Indicators provide visual indication that a sprocket is still within the allowable wear tolerance, and when replacement is required. Tsubaki wear indicator technology suited this application – the customer managed to save on maintenance man-hours as well as sprocket inspection being made easier with the wear indicator technology. Visual inspection was all that’s needed – no sprocket disassembly required. In terms of price, Tsubaki sprocket was 50% more than the competitor’s. However, the life span increased by 140% saving the customer $1600 and counting. This document describes Tsubaki’s patented SMART TOOTH technology features and benefits. SMART TOOTH technology is a simple visual identifier indicating when a sprocket has worn past its usable life and needs to be replaced. Wear indicator pins are strategically inserted into the thrust faces of the sprocket tooth where the resultant pressure angle of the chain roller creates wear. Eventually as the tooth profile recedes over time in service, the wear indicator pin becomes exposed visually identifying that it is time to replace the sprocket. Tsubaki SMART TOOTH offers users the ability to identify and schedule drive system maintenance. Predictable downtime is essential to cost effective part replacement ensuring critical component failure does not occur. Implementation of Tsubaki wear indicator technology makes sense for applications that are driven by capital equipment, or where non-scheduled downtime is simply not acceptable. Figure 2: Wear indicator pins and tooth edge showing a sprocket that has worn past its usable life and ready to be replaced. Tsubaki SMART TOOTH sprockets stand apart from all other sprockets in the industry. One set of wear indicator pins come STANDARD on every sprocket (front & back) ensuring they are visible on any application no matter the installation. 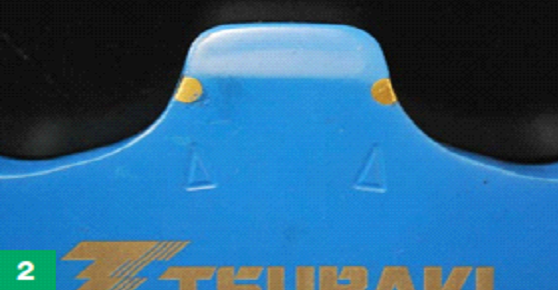 Next, Tsubaki has included the latest laser etching technology in which Tsubaki “SMART TOOTH” will be etched directly below the wear indicator pins providing even more visibility to the end user. The etching will occur on the Hub If there is not enough room below the tooth. Finally all Tsubaki SMART TOOTH sprockets are shipped with a special blue coating making it easy to identify which sprockets have wear indicators vs. which ones do not. Proper chain and sprocket engagement is essential to maximize the life of your chain. When chains and sprockets articulate correctly, the life of the chain is extended. This means long term savings and real value for any application. Sprockets have several points of high-friction contact with a roller chain, which is important to efficient rotation, but also wears the sprocket and roller chain quickly. Once a sprocket has worn past its usable life poor fit, alignment and chain wrap will occur resulting in loss of tension, jumped chain, drive slipping and catastrophic failure. Ultimately by using worn sprockets chain wear accelerates at an exponential rate causing the life of the chain to be reduced by up to 50%. North American sprockets adhere to ANSI code B 29.1, which regulates design, dimensions, and interchangeability within a chain drive. ANSI covers eight different strand types of sprockets: single-strand, double-strand, triple-strand, and multiple strands 4, 5, 6, 8, 10. ANSI sprockets are also designated with a preferred number description regarding tooth pitch in relation to the pitch of the chain calculated in 1/8” intervals. (Example, 40 chain would have a pitch of four-eighths of an inch, or 1/2”). SMART TOOTH wear indicator technology comes Standard on all MTO ANSI roller chain sprockets with a sell price of $1,000 or more, 80 pitch and higher and manufactured at the Tsubaki plant in Mississauga, Canada. Stainless steel sprockets are not included in the SMART TOOTH program but can be added upon request. Stainless steel sprockets are widely utilized in food grade applications due to its non-rusting characteristics. Wear indicator pins and laser etching will be included on these sprockets but will not be painted blue due to strict health regulations. Figure 5: 120-6W61 sprockets with SMART TOOTH wear Indicator pins, laser etching and blue finish. MTO ANSI roller chain sprocket teeth can be hardened or non-hardened based on the application and request from the customer. Wear indicator pins can be inserted into both soft and hardened teeth providing more flexibility to the customer. Hardness is a characteristic of a material and defined as the resistance to indentation by measuring the permanent depth of the indentation. All Tsubaki stock sprockets are hardened to RC35-50 standard which greatly enhances both sprocket and chain life while reducing the risk of failure. SMART TOOTH technology also applies to type A, B and C plain or finished bore hubs along with Taper-Lock, Split taper, XT and QD style sprockets. Style A sprockets are flat with no hub, Style B has a hub on one side only and Style C sprockets have hubs on both sides. 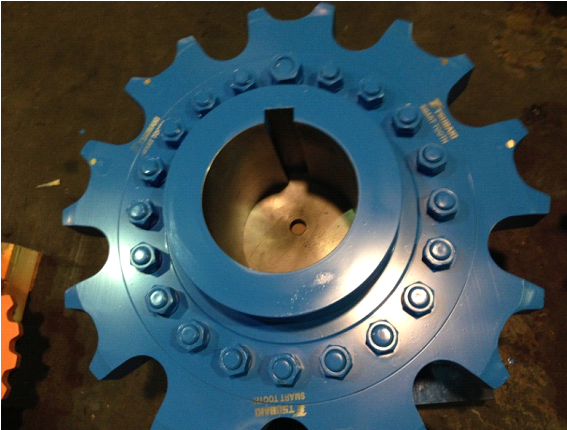 QD (quick detach) style sprockets are used where higher working loads are prevalent and higher clamp loading on the drive shaft is desirable. QD bushings are flanged utilizing large anchor bolts to retain itself to the sprocket while aligning the sprocket 90 degrees to the drive shaft assuring proper alignment. Taper-Lock sprocket bushings are similar to QD style bushings in that they both utilize a split through both the taper and flange to provide a true clamp on the shaft that is equivalent to a shrink fit. The bushing is retained to the sprocket with a series of set screws or if desired can be welded to the sprocket itself. The main advantage of TL sprockets is the ability to utilize multiple sized bores for a single bushing size. Engineering class sprockets vary from ANSI roller chain in that they do not follow ANSI code B 29.1, regulations and will typically have custom tooth profiles. 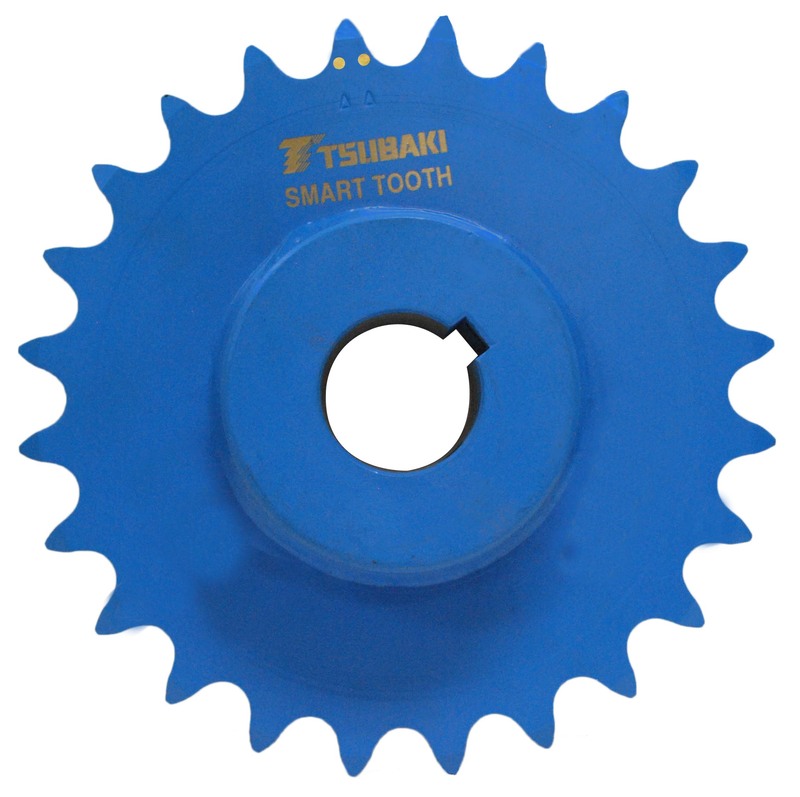 Tsubaki SMART TOOTH is available on all engineering class sprocket sizes no matter what the tooth profile with a sell price of $1,000 or more and manufactured at the Tsubaki plant in Mississauga, Canada. There are 3 barriers which prevent users from replacing sprockets which ultimately costs end users more money over time. Replacing sprockets can be expensive, specifically specialty made-to-order sprockets which can be highly technical and complex. These sprockets may also have long manufacturing lead times which can prove detrimental when last minute replacements are necessary. SMART TOOTH sprockets provide an easy visual indicator of how much sprocket life is left allowing for users to schedule maintenance downtime well in advance. This ensures worn sprockets are not left running and last minute sprocket will no longer be necessary. The price of sprockets are unfortunately a cost of doing business but customers now have the advantage of planning for this expense over time no longer guessing or waiting till the last minute to replace their sprockets. There are little-known standards for checking and measuring sprocket wear. Few people know how to do it and most will just do a visual inspection of the sprocket teeth making an educated guess when to replace. Others times sprockets are only changed when replacing the chain which can result in throwing away good sprockets costing large sums of wasted money over time. Customers no longer need to guess if a sprocket should be replaced eliminating wasted money. ⦁ Complexity of removing sprockets. Removing sprockets can be both time-consuming and complex causing long undesirable last minute downtimes. As a result, many companies choose not to replace sprockets running their equipment long past replacement dates. When there is no indication or reminder of when to change sprockets, it is easier to ignore resulting in shorter chain life, elongation and poor fit. Tsubaki sprocket wear indicator technology assures maximum uptime and drive system efficiency by providing visual confirmation of excessive sprocket wear. Incorporating this patented technology into MTO ANSI and engineering class sprockets reduces overall system costs by offering predictable maintenance intervals to avoid catastrophic failure.